complex concoction of tropical fruits, blueberry candy, and floral sweetness and the flavors are very much similar. How to grow Blue Magoo seeds pot plant pots? If you’re a grower with some level of experience, you’ll find Blue Magoo quite convenient to nurture and expect good yield. However, the biggest challenge for you’d be to source original seeds and at best you’d have to settle for clones developed from clippings of healthy mother plants. The plants grow short and tend to be bushy, having robust lateral branches. When grown indoors, the strain takes about 49-56 days to flower and every sq. meter yields 13 ounces of buds. However, the output is much higher when Blue Magoo is cultivated outdoors. 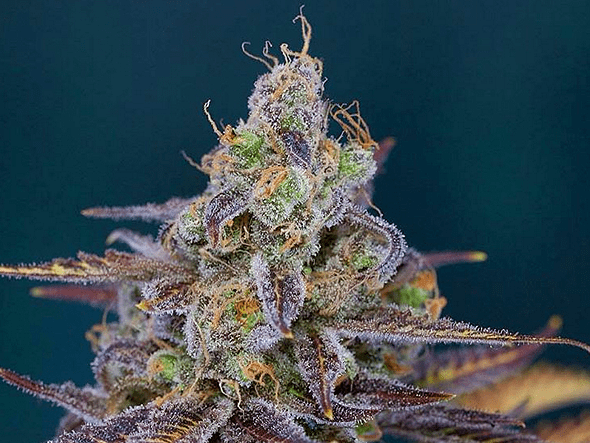 The strain grows best in temperate climes where the weather stays warm and dry. The buds are ready to be harvested around the first half of October when each plant delivers approximately 17 ounces buds. Top the soil with organic nutrients 4-5 times before flowering starts. The saplings should not be exposed to low temperatures or else the flowers will not develop fully. The leaves, branches and the canopy should be trimmed often to enable light to filter through to the lower levels. Exposing the maturing plants to cooler temperatures, 1-2 weeks before flowering commences will bring out their characteristic deep purple color and they’ll be heavy with the sticky resinous colas. The THC level of 16%-18% causes a stoning effect that intensifies slowly, ultimately leading to full relaxation and bliss. The scents and flavors are reminiscent of blueberry, berry and floral with understated hints of earthy, tropical and sourness.